Your scooter requires a source of electricity to power the lights, horn, electric start motor, and other accessories. It gets this electicity by generating it from the flywheel spinning around the coils on the stator acting as giant electromagnet. The power that comes off the stator is AC power, and it's output voltage varies depending on how fast your engine is revving. You may have noticed this fluctuation on a non-battery bike - your lights + horn get stronger as your engine RPMs are higher. The problem is that at higher RPMs there can be too much electricity for the bulbs on the circuit, and they will burn out. Some models of Vespas solved this by adding to the circuit a device called a 'Regulator'. This acts like a flood gate - if you have a 6 Volt regulator it allows up to 6 volts to pass through the circuit unrestricted. If the voltage ever gets OVER 6 Volt the gate kicks in and stops the excess by dumping it to ground. Regulators are fine if all the electrics on your bike are AC. If your bike utilizes a battery or has any DC components like horn, tail/brakelight, turnsignals or a radio then you're going to need to have a rectifier in the system. What's a rectifier? It's an electronic circuit that takes an AC input and converts it, or 'rectifies it' to a positive DC output voltage. You probably are using 'AC Adapters' in your house right now - on your laptop computer, or on your cordless or cell phone charger. All these devices involve a rectifier circuit - they take AC current from the wall and turn it into DC current to charge DC batteries inside the devices. Rectifiers in scooters do the same thing - they take AC input from the stator, and output a DC voltage to charge the battery when the engine is running and operate the rest of your DC accessories. The rectifier also includes a regulator component as well, to offer outputs of both regulated DC and AC. 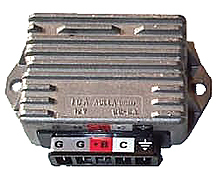 Rectifiers also come in 6v or 12v versions. Thanks to Eric Mazurak for writing all this out. It would have taken me ages to get it together.